Do you cook more Beef, Chicken or Pork recipes for your family? If you are anything like me, you are always looking for new recipes to try on your family. Beef is a great family dinner staple! It’s usually easy to find it on sale and, if you can get it in bulk, you can freeze it for a long time – even after it’s cooked! 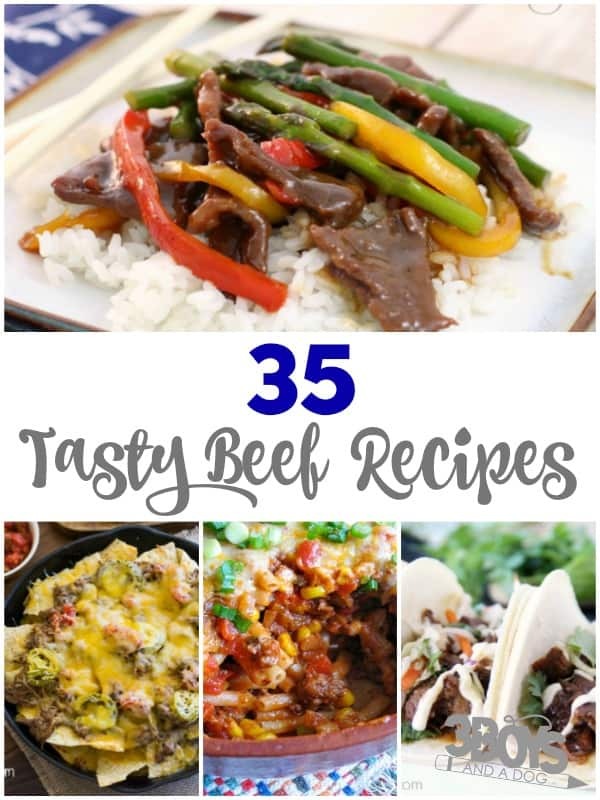 The next time you’re looking for a dinner to try, take a look at one of these tasty beef recipes to make the family! And be sure to browse my list of 50 ground beef recipes you can try too! Ever tried Apple Meatloaf? It’s sweet and savory and easy to make! Add a new flavor to a traditional dish and make this Dill Pickle Roast Beef! Try this Slow Cooker Roast Beef with Fennel and serve it over mashed potatoes. These Beef Tips with Bearnaise Sauce look so elegant – perfect for a special dinner! This Hamburger Soup would be wonderful on a cold day! Make Cajun Beef on Spiced Potatoes in no time and have a dinner everyone will enjoy! This Beef Enchilada Dip would be great for a party! Try this Balsamic Braised Beef! Just add rice and a vegetable and you’re done! Have a little Asian dish tonight with this Chinese-Inspired Beef Casserole! This Beef and Salsa Casserole is a delicious Tex-Mex inspired dish! Whip up these Slow Cooker Korean BBQ Beef Tacos and your kids will love them! Trying a paleo diet? This Paleo Asian Beef is a winner! I love how delicious this Herb-Seasoned Grilled Beef Tenderloin looks! This dish of Mongolian Beef with Vegetables looks amazing! Make a pot of this Saucy Beef Chili and serve it with biscuits! This Slow Cooker Beef Stew would be heavenly in the winter! I love Po’ Boys! But I never thought about having one with roast beef. This New Orleans Roast Beef Po’ Boy is one I’ll definitely try! Slow cook this Beer-Braised Corned Beef and it’ll be tender and juicy! Combine the best Tex-Mex flavors in this Southwest Ground Beef Casserole! Beef Stroganoff is always a winner with my family. But this Ultimate Creamy Beef Stroganoff looks even better! Love Mexican food? Make these Shredded Beef Tamales! These Greek Style Grilled Beef Lettuce Wraps are perfect for a low-carb meal! This Guinness Beef Stew is hearty and filling, even for picky eaters! This recipe for Biety Beef features dried cranberries for a new taste at the table! Serve a complete meal in one dish with this Asian Beef Noodle Bowl! These Dijon Wine Steak Kabobs with Mushroom Rice can be made on an indoor grill. This Spicy Beef, Tomato, and Corn Soup would go wonderfully with cornbread! These Mini BBQ Beef Pies are so cute for little ones to eat! Try this Corned Beef and Cabbage Casserole for a modern spin on a classic dish! Make the Best Ever Hamburgers and have an indoor picnic! Ever add beef to a salad? Try this Tenderloin Cranberry and Pear Salad and you’ll love it! Serve this Beef and Broccoli Stir-Fry over rice! Add beef to a kid-favorite and have Easy Beef Macaroni and Cheese for dinner! Pass these Shredded Beef Nachos around the table and let your family share! Put this Crockpot Beef Stew on and let your slow cooker do the meal prep for you! 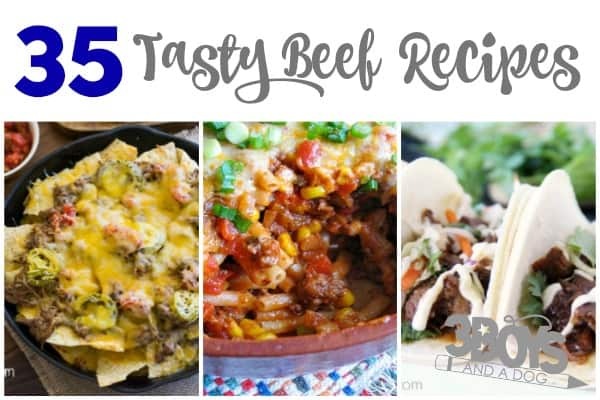 Use these great resources to make even more delicious beef recipes for your family! Great recipes to make! I love beef. Thanks so much for joining us at Delicious Dishes! We love your beef recipe ideas and hope you’ll join us again this week! Hey there! Thanks so much for stopping by and linking up your cute craft! Stop by again next week and link up another awesome project! Our family loves to eat and I try to use a variety of meats during the week. Your recipes are very good and I appreciate the posts. I like to vary our menu and try new recipes. I love all kinds of recipes and you have some good ones..